The original thought behind this Series material was aimed at people who counsel as leaders, such as Pastors, Associate Pastoral Staff, Youth Pastors and those that have a position of authority in the local church. As more digging was done on the material, the more it made sense to consider the application for an Encouragement Series for others to see the truths gleaned from the Scripture, as we consider consulting God’s Word in all facets of our lives, not just the one’s where folks believe they should insert their importance in our own lives to Serve the Lord. 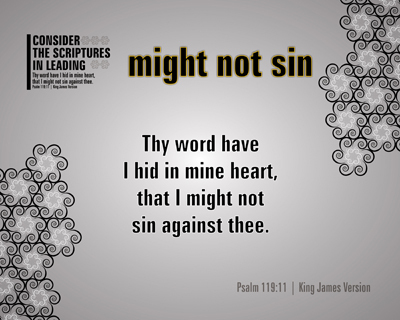 The shoe-leather of this thought is seen in not only this verse, but the remaining twelve tied directly to this thought. The passages of Scripture used in this Series are simple, yet VERY profound, giving us in a sense a responsibility to give our Heavenly Father the credit for the ground work before we make decisions that impact not only us, but potentially a multitude that we may be unaware. By having this ground work already under foot, so to speak, it will give the Christian leader a solid opportunity to connect and gauge where they are in tendering godly advice with biblical backing. As several of the prints include direct references to the heart (Psalm 119:11, Proverbs 4:23, Psalm 78:72), how we as Christians prepare to lead, consult, provide instruction – and even counsel, we must remember that our heart needs be RIGHT before we can hope to give right, live right and lead right. With our heart being right, others will be able to clearly see that something is different, even if they are not born-again Christians. Truthfully, I find personally that those who are NOT Saved hit the mark squarely by seeing what is in me and the ever present phrase, “You must be a Christian…”, because of the kind of witness I WANT to be. If we will take a few moments to think about the heart of others who are not born-again, blood bought, Children of God – their heart can and will so easily pull them into places we know better, but they may have NO idea what peril can come of the decision to continue on the path they are traveling. All the more, we should strive to make certain that we are in RIGHT standing with our Thrice Holy God of All Creation, before we attempt to be “Christian” in our daily lived lives. Setting the stage in our own lives takes time, effort and work to make it happen, but the benefits are INCREDIBLE not only for/to us, but for/to others we have influence over in our lives. No matter where you and I may work, what our responsibilities are or type of contribution made, we all can be a leader. The best kind of leader is one who is ALREADY following the leading of the Holy Spirit, wherever we may find ourselves. A baker’s dozen passages of Scriptures presented here are quick snippets of areas and standing, which can help anyone, not just those that are leaders in places where we see them. These twelve (12) plus one (1) are REALLY foundation setting as to how we are to treat others. Profoundly SIMPLE verses – single ones at that – that make an impact, for they are EASY to recall. See if these passages of Scripture are an Encouragement to you, as well as others – not only might it change you, it could be the change someone else is waiting to receive. What is it precisely that we Believe? Pointed question? This Series focuses on the word “Faith” as used in the New Testament of Word of God, the Bible. Except in historical accounts, every use of the word “Faith” in the New Testament is used in the present tense. The word “Faith” is used in some 231 verses of Scripture, coming from the New Testament for 229 of them. Only twice is the word used in the Old Testament as “Faith” alone. Is this important for us to know and realize? Certainly is – it coincides with something VERY important – we as Christians have living within us the Holy Spirit, as the Old Testament followers didn’t have the benefit. (27) And when Jesus departed thence, two blind men followed him, crying, and saying, Thou Son of David, have mercy on us. (28) And when he was come into the house, the blind men came to him: and Jesus saith unto them, Believe ye that I am able to do this? They said unto him, Yea, Lord. 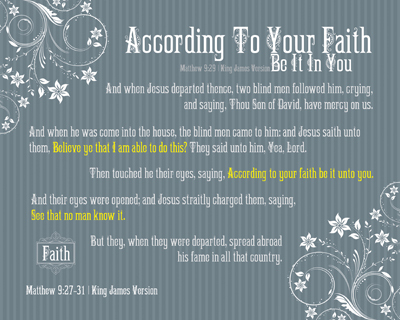 (29) Then touched he their eyes, saying, According to your faith be it unto you. (30) And their eyes were opened; and Jesus straitly charged them, saying, See that no man know it. (31) But they, when they were departed, spread abroad his fame in all that country. The reason for the word change to “in” is simply this, we are to live by Faith and in such a way that others have no doubt Who is the King of and in our lives. The reflection of the Redemptive Work done in each of us as Christians is something that even non-Believers can recognize without having to know how, what, where, when it was received. The Holy Spirit having residence in our lives when we have a daily walk with our Heavenly Father is the greatest reflection of His Love for both us and others. This Series is HUGE – toppling in at 338 passages of Scripture reviewed for the development, each with a context wrapper – making sure to be true to the discovery and presentation. There are twenty-six (26) Expectations prints which will be very familiar to the seasoned Christian, but may be less recognized by not as well Bible versed Christians. They were chosen for the ease in which they can be made into application in our daily lives. This Series is dedicated to a very special young lady, Ms. Sarah Hunt, who is facing eminent and full liver failure, as her condition is well advanced. As her mother and I chatted just days ago, it became VERY clear that what we were exchanging in conversation was THIS SERIES – a prime example of what both of our Faith’s were doing, one in comfort and the other in consoling from God’s Word. How incredible that God the Father would allow our two families to intertwine in such a way that we would see INCREDIBLE and WONDERFUL things happen, even in the face of such a situation. It is because we BOTH (families and individuals) have a Faith in us that is the Comforter of such an hour. Will you and I Believe what is written in His Word, the Bible and Holy Scriptures? Do we know He is Able? Have we the Faith that what He says He Will Do, that He Will Do? It really is all about Faith. Our own Faith is what we will have the measure dealt unto us, but others are looking, seeking and longing to see what “work” the Holy Spirit is causing deep inside of us individually. The first of which is Salvation – we have to place our Faith in the Finished Work of Jesus Christ, His Blood bought Redemption. We will only show forth as much as is given time, place and priority in our lives. Placing our Faith and Trust in Him for Eternal Occupation, will change our Earthly walk, praise, learning, worship and sharing by default. Would you and I have enough Faith in us, that if we were faced with Jesus Christ Himself being here to heal us from some affliction, disease or burden, that we’d experience the healing fully? Our Faith needs to be INCREASED, not only for our sake, for the sake of others we have the responsibility to be a witness of the Greatest Gift that has ever been given – Redemption, by the Blood of Jesus Christ. To My Sweet Sarah – this one is for YOU! The topic of Revival can mean all kinds of different things to a host of varying people, whether that be “religious”, “spiritual” or “Christian” just the same. In my more impressionable years as a child, the topic of “Revival” was a big deal – when our church was “having it”, we were there “for it”. There would be singing, shouting, preaching and praying to stir up the Spirit of all in attendance. It seemed like the “adults” were in tune with Spirit, with the “children” getting more restless as each night progressed, as this “reviving” would drag on for hours. Once the “set aside” time of Revival was closed out, very little changed. REMEMBER this is being presented from non-regenerate soul’s point of view. A brief recall of several of those Revival meetings comes to mind, where several people did have a transformation occur in their lives – to a point where their lives changed, both on the inside and outside. Simply put, their Worship changed. Why did it take a Revival meeting to cause a change in Worship for so few people? I believe it is because we Christian’s as a whole don’t understand what genuine Worship of the Heavenly Father, petitioning the VERY Throne Room of Heaven, should be much past getting Saved by placing their Faith and Life in the finished work of Christ – Salvation. One of the BEST Revival meetings that I’ve been to in a LONG time was held at our home church, preached by Bro. John Anderson, our Revivalist. He specialized in the simple to remind us of something that is one of the most difficult things to wrap one’s mind around – just how MUCH God LOVES each of us. Us being able to see this Truth points us to God’s Word immediately, which is JUST the place where we are Encouraged to Worship Him. 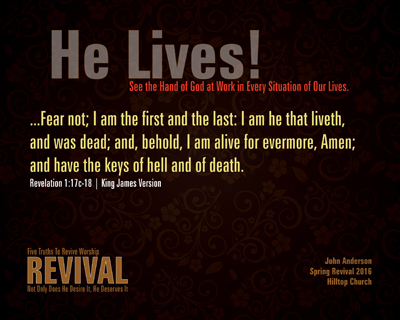 Revival should be experienced daily by and in the means of Worshiping Him with EVERY Born Again Believer. Don’t YOU want to have that kind of Relationship with the One who provided the means of Salvation, through the Sacrifice of His Son? I SURE DO! See the Hand of God at Work in Every Situation of Our Lives. Never Walk The Same After An Honest Meeting With God. Even in the Midst of Trial, Tragedy & Heartbreak. God Has Everything You Need, Run To Him. Take a Step Toward Him, He Will Sprint Toward You. These are five reviving pictures that will change our very lives forever, should we be faithful to desire Revival each and every day we live. They may seem like they are cliché to a degree, but they can be fully appreciated and understood by those who will seek to have real Worship each and every day of their lives. The more of God’s Word we know, the more time we spend with Him in Prayer and the more we have a desire to serve Him – the more important it will become that we stay ever more close to Him. He desires to hear from His children. It is amazing how the simple can confound the difficult, how the most basic of things can be an explanation for the complex and most of all, how the All Powerful, Creator God wants to have a Relationship with each of us. The nuts and bolts of Revival is to bring us to a point where we will consider our Relationship with our Saviour, with our Creator and the sensitivity we have to the Holy Spirit, who resides within EVERY Christian. Why? He desires that we know Him, for which we should understand that He Deserves our attention as the very least. We indeed will ONLY be as close to our Heavenly Father as we have the desire to be close to Him. James 4:8a reminds us “Draw nigh to God, and he will draw nigh to you.” Something that our Revivalist said stuck in my mind – “Do by Faith; not about a Place, it is about a Person – the Person of Jesus Christ” We have been given every resource, reason and recommendation – but the move is strictly up to each one of us individually. Personally determine, along with me, that our Worship is what needs to be worked on – daily – adding to those appointed times during the year when we have Revival to give us a perspective as a body of Believers in our churches. Start with the first one – He Lives! See what He says to us in His Word about His Existence and our Reliance on Him for Eternity. With each step closer to Him, your and my Worship of Him will change us from the inside out – others will want to know what is happening – folks can easily share things about Individuals they spend time with, allowing us to share the Gospel and the Gospel Maker with them, even easier.